You’re in the middle of planning your wedding, and you’ve found the perfect dress, the venue of your dreams, you’ve picked your color palette and decided on your wedding party. Things are coming together just right, but somehow, it feels like your wedding is shaping up to be just like every other wedding you’ve been to. You want to customize your wedding and make it feel like your own, but how? Here are some ideas to make your wedding uniquely yours. Social media plays a big part of many of our lives. We Instagram, Facebook, Snapchat, and Tweet. Many brides use social media as a way of announcing engagements, and wedding plans. 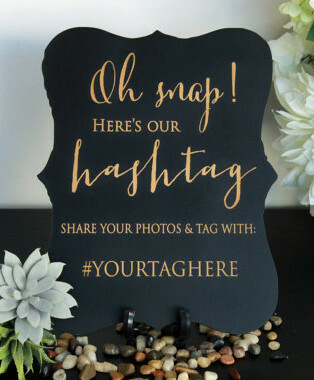 So why not take advantage of the social media trend and create unique hashtags for your wedding? Hashtags can be a great way for your friends and family to share well wishes on your wedding day. And, with smartphones all around us, you can be sure that your guests will be taking candid photos during your wedding and reception that you probably don’t want to miss. Ask them to use your wedding hashtag on social media, and you will have a whole other photo album to help document the day. 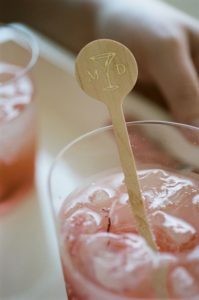 Custom cocktails are a fun way to share something special about your relationship with your guests, and make a trip to the bar a little less mundane. How do you come up with your unique drink? Start by thinking about experiences that you and your groom have enjoyed that included a memorable drink. Perhaps a vacation spot had a fun beverage that you both enjoy. Or, you both share a love of scotch, whiskey or beer. Pick your favorite and share it with your guests. If you are planning your wedding around a holiday or special event, select a cocktail or beverage that matches the holiday or theme. If hashtags and custom cocktails aren’t your thing, then try customizing your menu. 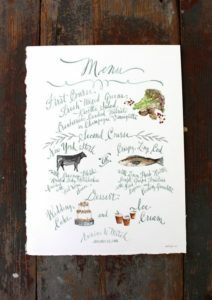 Instead of using the run of the mill menu of beef, chicken or fish, design your menu around special events, favorite date spots, or vacation highlights. Perhaps you and your groom love going out for beer and burgers on Friday night, or sushi is your go-to mid-week meal. 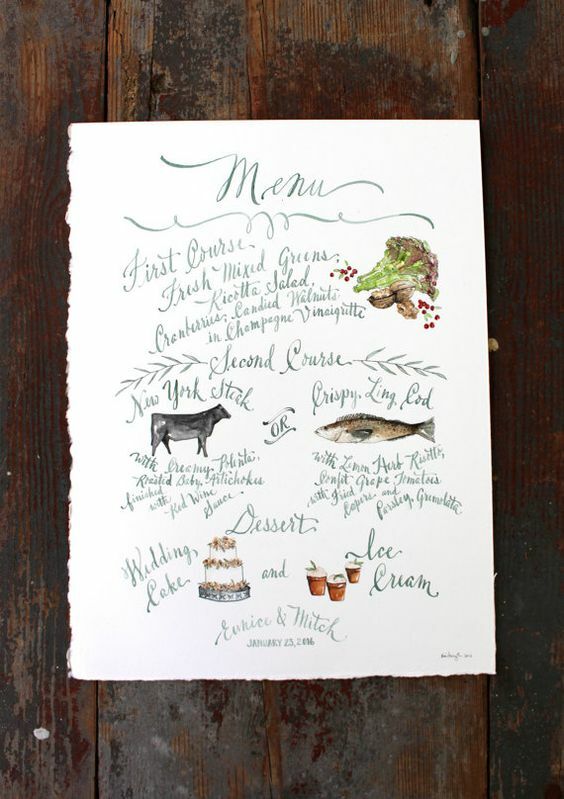 Consider adding these sorts of items to your wedding menu. If you aren’t sure that your food choices will work for your event, consider adding your favorite desserts or guilty pleasures to the menu, along with the cake. Companies create a logo to help customers remember who they are. You can also create a custom logo for your wedding that allows you to tie all of your elements together, and make a unique statement that will be memorable for your guests. Your unique logo doesn’t have to be complicated. Combine your initials into a fun design that is uniquely you. If you need more inspiration, think about a shared favorite hobby, a love of a particular place, or perhaps your pet. 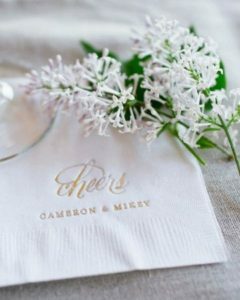 Once you’ve found the perfect logo, use it on napkins, favors, place cards, stationary, or stir sticks for that custom cocktail. Not only do you tie all the elements of your wedding together, but you have a unique reflection of your relationship to share with your guests. Still looking for ideas for how to make your big day unique? Let our wedding professionals help you find that special idea that turns your wedding from typical to stand-out. Contact our wedding planning specialists to learn more about how Platinum Banquet Hall can make your wedding amazing.